Digital copies and codes not included. Video in good used condition, 100% guaranteed to play like new. 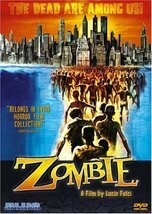 Released on DVD the same day as horror specialists Shriek Show offered a more feature-packed, two-disc Special Edition of the same film, director Lucio Fulci's gore-drenched zombie effort has been lovingly remastered by William Lustig and the folks at Blue Underground to offer a near-flawless transfer despite its relative lack of bonus materials. Presented in 2.35:1 anamorphic widescreen, this transfer is simply the best presentation of this film on DVD to date. Rumor has it that both Blue Underground and Shriek Show have used the same print in striking their transfers, though Blue Underground's stellar transfer edges slightly past Shriek Show's with an image that is both sharper and offers more accurate colors and skin tones - making this the disc to buy if you're simply looking for the best transfer possible. With bright, vivid colors -- including reds that seem to leap from the screen -- rock-solid blacks, and little evidence of edge enhancement, the visual presentation here is near flawless. Audio presentation is solid as well, and with Blue Underground offering no less than six audio options (three in English and three in Italian) with optional English subtitles, viewers can choose to watch the film in a variety of ways. For purists, Blue Underground has included the original English and Italian Mono mixes, which place emphasis on the voice track and ring through loud and clear without distortion or hiss. Equally clean are the Dolby Digital 2.0 Surround and Dolby Digital 5.1 tracks, with the Dolby Digital 5.1 mix, in particular, carefully updating the soundtrack by offering directional effects that remain faithful to the original mix while truly packing a punch that will undoubtedly satisfy those with solid home theater systems. As previously stated, the bonus materials presented here pale in comparison to the Shriek Show release, and though they are limited mainly to promotional materials, there are a few gems to be found. While the original Italian trailer doesn't shy away from revealing some of the film's more shocking gore effects, the U.S. trailer offers only brief glimpses of the zombie menace while warning viewers that they will be supplied with "barf bags" lest their sensitive stomachs have an adverse reaction to the wildly explicit gore. Television spots closely resemble the U.S. trailer by reiterating the warning of the aforementioned trailer, and radio spots featuring an ominous-sounding announcer are sure to send a chill down the spines of the easily frightened. Poster and still galleries offer a wealth of fantastic images, and in addition to the much talked about shot of the large zombie from the opening scene emerging from the New York harbor (on a poster apparently autographed by Fulci himself, no less! ), viewers are also treated to a humorous shot of the same zombie relaxing with a cigarette between takes. For those wanting to learn more about the legendary Italian director, an extended bio traces his career from his earliest days training with Luchino Visconti and Michelangelo Antonioni to his touching final appearance at the 1996 Fangoria Weekend of Horrors in New York.